Maj. Gen. Richard Mills, commander of Marine forces in Afghanistan, took 30 minutes out of his busy schedule yesterday morning to discuss the state of his area of operations and the progress Marines have made there. Much of it will appear in a story in the print edition of Marine Corps Times next week, but I wanted to post one piece of news now: Marines who split off the amphibious assault ship Kearsarge in January to deploy to Afghanistan won’t likely be there much longer. Mills declined to discuss future operations and the timeline, but most of BLT 3/8 arrived in Afghanistan in January on what was believed to be an assignment lasting only a few months. 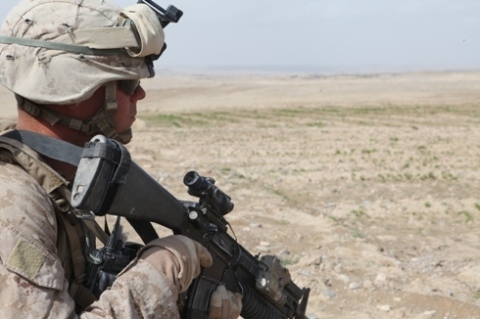 The general credited them with allowing combat engineers to speed up the construction of a highway, Route 611, from central Helmand province to Sangin district, the site of violent fighting in the fall. They deployed primarily to the upper Gereshk Valley, found in between Sangin and Lashkar Gah, the province’s capital. BLT 3/8 has worked heavily with Delta Company, 1st Tank Battalion, out of Twentynine Palms, Calif. The rest of the MEU remains off the coast of Libya, but Lejeune’s 22nd Marine Expeditionary Unit will deploy soon and could relieve the 22nd MEU. I love you baby I cant wait to be back in your arms i miss you soo very much!!!!! Getting to see you even though its through a pic makes me soo happy!!!!! tanks!!!! get some & be safe 3/8!